Andrew Carpenter was one of three witnesses to give evidence on Day 11 of the trial - the last day of cross-examination of Post Office witnesses. You can read it here or embedded below. For a write-up of the day, please have a read here. Hello. This crowdfunded blog has been set up to cover the group litigation action against the UK Post Office at the High Court. Your contributions fund my reports and presence in court. I attended every day of the 1st (common issues) trial in 2018. Judgment was handed down on 15 March 2019. 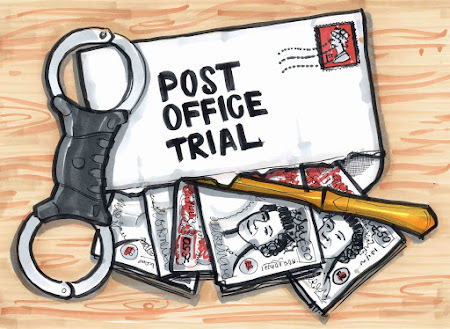 The 2nd (Horizon) trial started on 11 March 2019. If you want to make a donation, I would be very grateful. Hit the paypal button below. Everyone who donates £20 or more will get the secret emails I send out to my backers. The more you can give me, the more work I can do on this story. Support this blog via paypal, spend £20 or more and get all the secret emails too! "The horror of that whole Post Office fiasco was a major factor in her death." © Nick Wallis 2018. Simple theme. Powered by Blogger.